EAST LANSING, Mich. — The therapy dogs have competition. 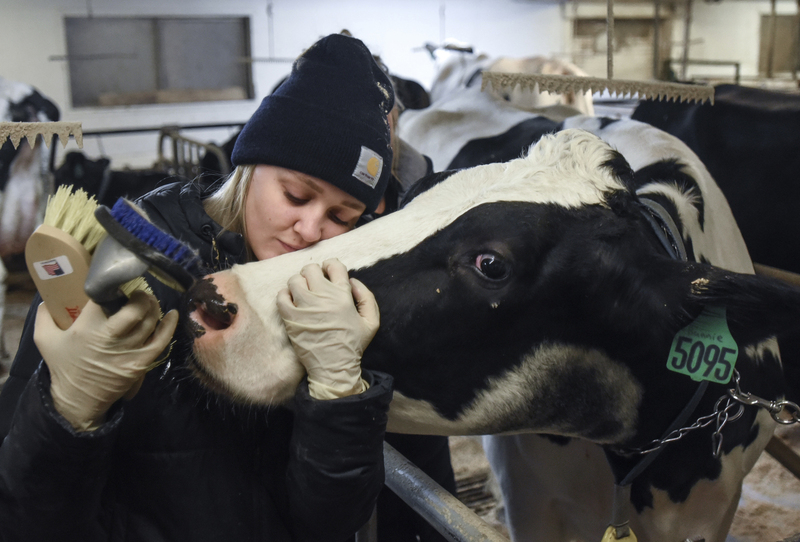 With finals this month, Michigan State University students can unwind by spending quality time with the school’s dairy cows at the Dairy Cattle Teaching and Research Center. The event is called “Finals Stress mooove on out!” It’s the first time the center has done an event like it. Zoology student Alicia Gamache became fast friends with a cow named Sunday. She’d visited the dairy barn because she was intrigued by the idea of getting close to animals she had only seen at school events and county fairs. Gamache joked that she’d take a cow brushing class if MSU offered it. As students visit the barn, Mead gives them pointers about how to not spook the animals and talks about the milking process. She answers questions about cannulas — a porthole-like device that gives researchers easy access to the first chamber of a cow’s stomach — and what happens when the cows stop producing milk. Psychology senior Meryn Mostrom beamed as she wandered, brush in hand, through the barn with her boyfriend. Her boyfriend, Alex Lafler, surprised her by taking her to the event.